Belle, Carrie and Dave have you covered this holiday season from Christmas through to New Year’s and beyond. Birthdays, too! Friend [email protected]’s official account to get the set for free. Expiry Date : Available till January 18, 2019. 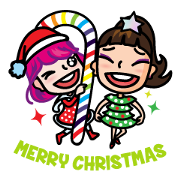 Copyright : Lendlease Retail Investments 1 Pte Ltd.
How to get GIF of animated and transparent background on LINE sticker? Previous post BCA Virtual Assistant VIRA Is Back!